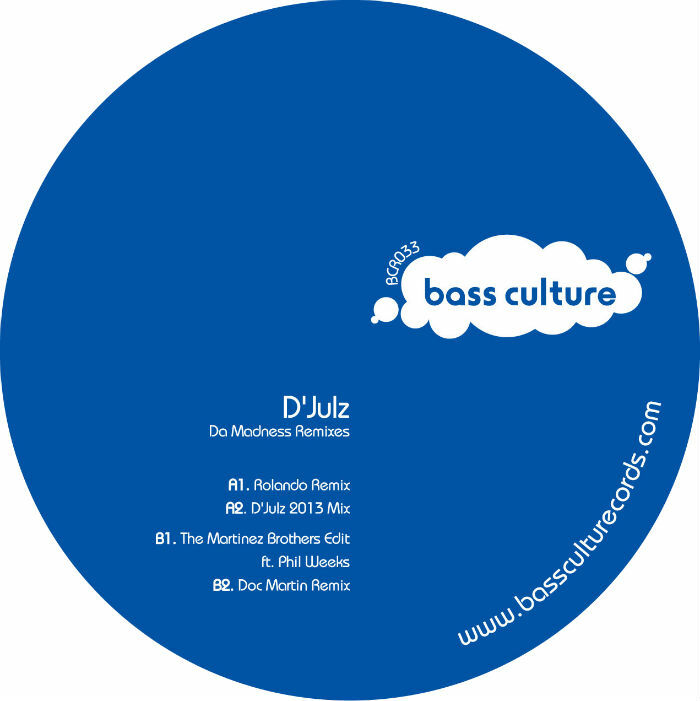 D’julz is one of those increasingly rare types of DJ, one who never really shouts about himself or self-promotes, yet retains a high level infamy and respect from many of his peers within the house music scene. He lets the music, and his own skills, do the talking and has built up a sterling reputation through his hard work and dedication to the cause. Having been involved in music for over two decades, he continues to work, travel and produce and play the music he loves, sharing it with thousands around the globe. At the same time he manages his own influential record label, Bass Culture, which is where we find a new release that merges the past with the future. On this new EP we get a taste of D’julz’s past, as he releases a package aimed to reinvigorate one of his own stone cold classics, Da Madness. A track built around a smooth, groovy bassline surrounded by the sharpest of snares and bouncing drums, and of course that unforgettable Jamaican spoken word sample, Da Madness is a cult classic and one of Bass Culture’s early successes. In order to give the original the respect it deserves, a stellar line-up of remix artists have been drafted in to give Da Madness a new, and very respectful, lick of paint; Detroit’s Rolando, house maestro Doc Martin and new blood The Martinez Brothers, along with Phil Weeks. Rolando is first to step up and he submerges the track in the deep end, roughing it up with a gritty analogue bassline, pumping plenty of venom into those claps that clash together relentlessly as the vocal joins them. His mastery of production is evident throughout as the pace picks up and becomes frenetic, only the occasional lull allowing for some breathing space before the onslaught continues. Doc Martin’s version flips the script yet again, this time instilling a sense of high tension throughout. Subtle strings in the background are accompanied by warped saxophones which ring out like sirens and an intense bassline that keeps you gripped for the track’s duration. Get ready for the switch up halfway through as the Doc prescribes some more swinging grooves, but it’s not long before the ‘madness’ continues and he ups the ante once more. New York duo The Martinez Brothers continute their run of fine form with their remix, teaming up with French house master Phil Weeks. Their mix takes the track back to the late eighties, pumping it full of aciiieeeeed with an unstoppable 909 bassline. Much like the other two mixes, the energy levels are high and refuse to relent, only when the bass drops a couple of times here and there can you regain your composure. But, who really wants to be composed when the music is this thrilling?! Finally the man himself D’julz updates his own track, giving it a 2013 update. It feels muted, yet the underlying velocity of the track is still very prevalent. It’s a rolling house cut with a powerful bassline and scintillating percussion, which complements the original perfectly. Bass Culture’s reputation for providing the very best house music continues to grow with this release, which takes one of the label’s most popular releases and offers up four new classic incarnations that are all destined to become classic in their own right. Who could ask for anything more? Out on vinyl & digital July 2013. This entry was posted on July 19, 2013 at 12:26 and is filed under Release.